Consumer drones have become big business in recent years. Not only have these flying machines gotten better but the prices have shot down. That’s great news for everyone. Some people love to just fly these things; others like to take aerial photographs and record video. Many pilots enjoy both pursuits? Even kids can take to the sky now thanks to the plethora of cheap toy drones available. Now there’s a new game in town and it’s gaining momentum. I’m talking about the phenomenon of drone racing. Drone racers compete in First Person View or FPV for the ultimate experience. FPV works by letting the pilot (that’s you) see what your drone’s camera sees on a screen in real-time. It’s not only for drone racers, though, it’s a flying experience for all enthusiastic drone pilots to enjoy. Feel free to jump straight to the reviews if you already know what FPV is and just want to view the best products available. Keep reading this short intro if it’s all new to you. 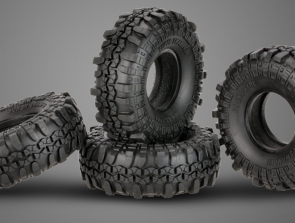 Crash resistant and has beginner-friendly features. Has immersive FPV experience (goggles & LCD monitor). Long flight time, fast charging and has a flexible Gimbal. You may be wondering why not just lift your head up and keep an eye on your drone that way. Not everyone wants or needs FPV. All drone operators had to fly their unmanned aerial vehicles (UAV) by Line Of Sight (LOS) up until more recent times. This is still popular for the most part. But the demand for FPV increases as technology improves and drones fly further, higher, and faster. Here are the main disadvantages of flying by LOS. Now you can appreciate the real advantages of flying a drone in First Person View. 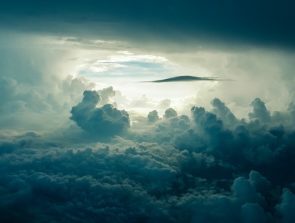 You see what your camera sees and thus become the eyes in the sky. But you need to wear FPV goggles for the ultimate and most immersive FPV experience though. No other method comes close. A quality drone and a decent pair of FPV goggles are the nearest you’ll ever get to being a flying human. It’s hard to put into words the exhilarating experience that comes from FPV and especially when racing. It’s the closest you’ll ever get to being a bird without actually leaving the ground. Those who experience flying quadcopters in FPV never look back. Before we launch into the reviews it’s important to just look at the basic FPV setup and how it works. I won’t go into individual products here as I have a page dedicated to accessories. This display is often a popular mobile device like a smartphone phablet or tablet. The quality of the display depends on the display screen itself and the quality/capability of the camera. The distance you can experience FPV will also depend on the drone and its transmitter. Those who enjoy FPV on a mobile device are soon keen to experience the real deal via FPV goggles. As this guide is about FPV capable drones I won’t get too involved about equipment here. If you want to consider FPV goggles keep these five points in mind. Although I write these reviews they’re not just about me and my preferences. This is a factor but it’s not the only one. To ensure I bring you the best FPV quadcopters available I take other things into consideration too. These include opinions of industry experts and also feedback from real users. Now let’s get into these no-nonsense reviews and introduce you to some of the best FPV drones around. The table below shows the seven best picks available at the time of writing. 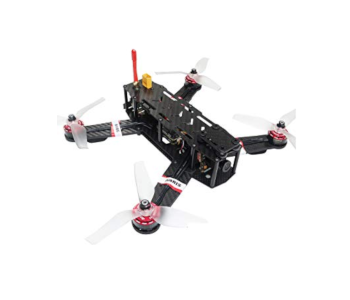 I have included FPV beginner-friendly drones at the top, followed by FPV racing drones. 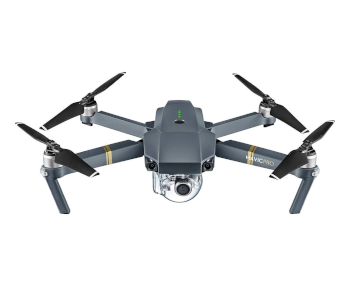 The picks at the end of this guide are FPV camera drones aimed at aerial photographers and videographers at the prosumer level. This guide looks at the popular First Person View quadcopters but you can find capable hexacopters and octocopters with FPV as well. I have separate guides for these so please refer to those if that’s where your interest lies. My first two picks are beginner-friendly quads. The first one is suitable for smaller kids—under the supervision of someone older of course. I’ll start this guide with the popular Force1 U49W FPV camera drone. It’s a great-looking craft and particularly good for beginners. Let’s take a look at what’s on offer. The minus points are a bit unfair for an entry-level drone. They’re still valid points and buying considerations. But what we have here is a fabulous little craft for the price tag. It’s certainly a good introduction to First Person View. Even the 720P HD camera produces decent results where others in the same class fail. The 15 minute flight time is effectively 30-minutes thanks to the bonus battery. You need to use your mobile device to enjoy the FPV experience with the Blue Heron. The drone’s capable WiFi camera will display live footage on either iPhone or Android devices using the free app. Those new to FPV never forget the first time they got to view what their camera sees in real-time. The best thing of all about this craft is that it’s so easy to operate. It sports a number of beginner-friendly features like one-key take-off/landing, headless mode, and altitude hold. There are also three different speed modes that allow pilots to ease themselves in at their own pace in their own good time. There are cheaper FPV drones around. Despite this, you’ll be hard-pressed to find one of this quality and with this many features for this kind of money. The DBPOWER UDI U842 Predator WiFi FPV is a great choice for beginners wanting to experience First Person View flying. The trick with this little beauty is to understand the FPV range limits (see below). 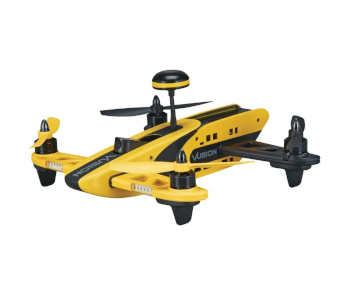 To fly this puppy you need to connect an iOS or Android mobile device to the 2.4GHZ remote control. 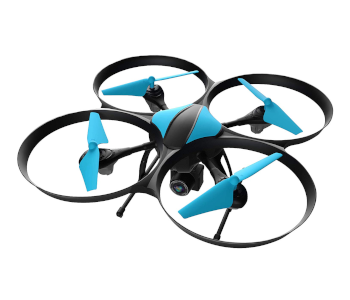 The 7-minute flight time is on the low side of average for a drone in this price range. The good news is that you get a bonus battery which gives you almost 15 minutes of fun. Always remember to let the motors cool down for a few minutes between battery changes. The long charging time is disappointing so you may want to order a couple of spare batteries. The First Person View (FPV) experience will not disappoint first-time pilots. Once this quad becomes your eyes in the sky you’ll never want to fly any other way. The camera is a good average quality for a drone costing less than $130 (at the time of writing). There are a few complaints about choppy FPV transmission but this is most likely due to flying out of range. The maximum flight range is 80m (263 ft.) flying in normal conditions. However, DBPOWER suggests flying the drone no further than 30m in Video Control Range. They also suggest closing any other open apps on your mobile device to ensure a smoother FPV experience. Follow these guidelines and you shouldn’t have any issues with choppy FPV transmission. The 720P HD camera won’t blow you away but then we can’t expect perfection for a budget-priced FPV quadcopter. It’ll still provide you with perfectly watchable footage and lots of enjoyable FPV experiences. There’s not much to fault, not with this price tag. You’ll want to consider the DBPOWER UDI U842 Predator WiFi FPV quad if you’re looking for an entry-level FPV drone on a tight budget. Drone racing is growing at an exciting rate. Drones for racing are not the same as camera drones that pilots fly to take aerial photos and video. 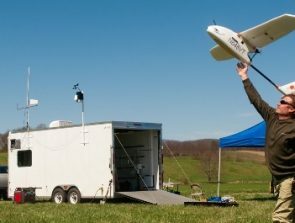 Racing unmanned aerial vehicles (UAVs) are typically quadcopters built for the purpose. If you’re keen to get into FPV racing events then keep reading. Next up are a couple of racing drones. Competing with fast flying robots is taking off in a big way. 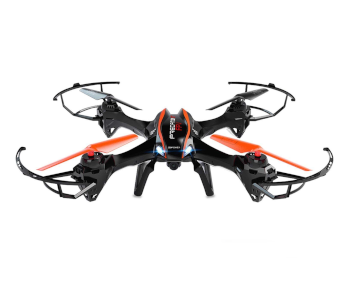 A great introduction to the sport is the RISE Vusion 250 Extreme Ready to Fly FPV. The first thing to notice about this racing quadcopter is the design. The smart yellow and matte black colors make it stand out—in a good way. The build consists of a special impact-resistant airframe. This makes it strong and durable against those inevitable crashes and collisions. It’s also a Modular construction so it’s easy to repair if you do any damage. Drone racing takes more skill and quick thinking than everyday flying. But every enthusiastic quad racer has to start some place. That’s where the RISE Vusion 250 Extreme comes in. It’s a user-friendly 3-skill mode craft that allows the pilot to develop their flying proficiency in their own time. You don’t have to worry about buying extras with this racing quad. It really does include everything in the box to get you going. There’s the 600TVL camera, high-quality LCD monitor, and FPV goggles for that immersive flying experience. You also get the video transmitter (200mW) with 5.8GHz technology that lets you experience flights in real time. There are none of those latency issues either that you get with some quads. The video transmitter even comes with 8-raceband channels. This is normally only seen with the higher-end FPV racing kits. The actual flight range seems to be something of a secret. I’ll update this guide if I can find anything official on that at some point. Maximum flight time is around 8-minutes. I know it doesn’t sound much but when you’re flying a robot at high speeds it’s not too bad. It’s always a good idea to invest in a couple of spare batteries. At just 90-minutes the battery recharge time is pretty reasonable. Buy the RISE Vusion 250 Extreme Ready to Fly FPV if you’re new to racing quads and it’s within budget. You won’t find a much better deal than this one at the entry level. Want to explore other options? I also have an entire guide dedicated to FPV racers. Read Fastest Racing Drones here. The second of my FPV racing drones is the ARRIS X-Speed 250B FPV quadcopter. It’s a different beast from the previous pick and looks more like an unfinished Meccano project than a flying quad. Don’t be put off by the design of this quad. The previous pick is handsome but good-looks are not a key or necessary feature of racing quads. The important points are speed, thrust, agility, and ease of use. The fastest quads of all are the kits—the ones your build and configure from the ground up. Few jump in at the deep end though. The ARRIS X-Speed 250B is another beginner-friendly RTP racer. The faster you fly the more likely you are to have a midair crash or collision. The good news is the ARRIS X-SPEED FPV250 is tough and sports durable arms that give it good protection. This drone comes with an adequate 700TVL camera that you can adjust from 0-20°. Although the video is a far cry from 4K cinematic quality it’s still perfectly acceptable for racing in FPV. The quads vibration damper plate does a good job at filtering flight shudders to steady the footage. The Arris Xspeed 250 has a powerful radio link AT9 transmitter. For FPV experience you can watch real-time feeds from the FPV 5.8G video transmission. You’ll want to invest in a pair of FPV goggles (not included) for the ultimate FPV experience. Make sure the brand is compatible with your quad before buying anything. Fat Shark Dominator V3 goggles seem to be a popular choice. Although this is an Almost-Ready-To-Fly drone, it still needs a bit more tinkering than the RISE Vusion 250 Extreme. You may also need to buy some extra bits like the essential battery charger or the optional goggles. Although picks #3 and #4 are both racing quads they’re still different. Which works for you—if any—will come down to personal preferences, enthusiasm for racing, and expectations. The ARRIS X-Speed 250B V2 250 FPV Racing Quadcopter is not ideal for the complete novice. It’s better suited to those with some flying experience behind them or for the serious enthusiast beginner at the very least. It’s affordable, adaptable, and performs exactly how it should do. Camera drones are the most popular of them all. Holiday snaps will never be the same again. With these flying robots you can enjoy aerial photography and videography at the fun level or something more serious. First Person View lets you take filming and photography to places you may not otherwise have gotten to if it weren’t for the FPV capability. Holy Stone is a household name when it comes to affordable quality quadcopters. The one we’re going to look at here is the Holy Stone HS400 FPV Capable Camera Quadcopter. 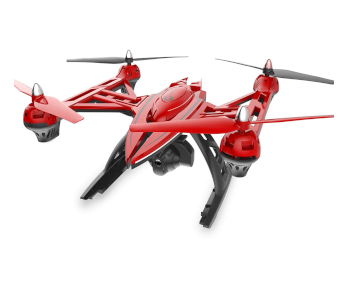 The Holy Stone HS400 is a large quadcopter when compared to a lot of drones. This is something that’ll either draw you in or turn you off. The HS400 is also a capable FPV drone with an adjustable HD 720P camera (more on that shortly). Like a lot of today’s drones, this one is fairly crash resistant though it has an extra neat feature. They’ve designed the blades to pop off on impact to prevent bending or breaking. This quadcopter is easy to fly at the novice level despite its large size. It’s better suited to the beginner in some ways because you can easily see the craft respond to your commands. This is something that’s more difficult with tinier quads. The instruction manual isn’t the clearest though. The good news is that you can find plenty of questions, answers, and flying tips on YouTube should you need help. There are the usual fancy flight options too like the 3D front, back, and side flips. This quad is a little less agile and heavier than some of the tinier UAVs though. Therefore, it’s a good idea to get familiar with the HS400 before flying in flip mode, especially as the battery gets low. Connect a smartphone to the intuitive 2.4 GHz remote controller (included) to get into FPV flying mode. There’s an adjustable phone grip at the top to house a mobile device. Now you can experience real-time video footage on your screen. You get to see exactly what the quad’s camera sees from the sky. You can also control the visual effects thanks to the adjustable lens on the 720P HD WiFi camera. Holy Stone is a brand to be reckoned with. Their products are popular for good reasons and the affordable Holy Stone HS400 is no exception. I recommend this craft to anyone who fancies a bigger quadcopter with all the important bells and whistles—including First Person View capability. Anyone who knows anything about consumer drones will know the name DJI. In this review, we look at the company’s high-quality Mavic Pro FPV Quadcopter Fly More Combo Pack. The DJI Mavic Pro might be small but it’s also powerful and feature packed. It’s quite fast too but it’s not a racing quad. This is a good quality camera drone. It produces excellent video and aerial photographs for serious photographers and videographers. You can attach a compatible mobile device to the transmitter (included) For the First Person View experience. You’ll want to wear the Xtreme VR Vue Virtual Reality Viewer (also included) for the best FPV immersive experience. First Person View lets you venture further and explore things that are out of your line of sight. It’s the nearest you’ll get to actually flying in the sky. Seriously, you have to experience it to believe it. Flying drones will never be the same again. 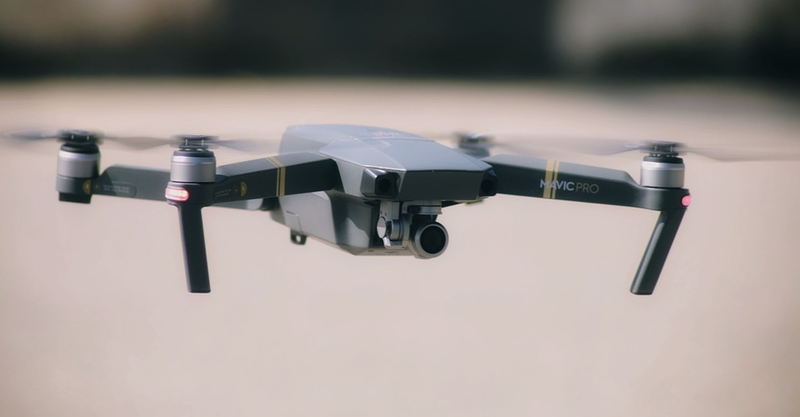 There’s also the Mavic’s long 27-minute maximum flight time that gives you plenty of time to pilot your craft and explore the world from above. And at 4.3 miles the range is more than impressive. Add the drone’s precision hover and its image stabilization and it’s easy to see why this is such a popular FPV quad with so many UAV pilots around the world. This Mavic bundle is a bargain but it’s not cheap. If you have the budget and the drone checks all your boxes this could easily be your dream craft. The tiny size is not to everyone’s liking and it can also be a bit unstable in blustery conditions. Overall, though, there’s much more going for the DJI Mavic Pro than there is against it. The last of my First Person View quads is the capable Parrot Bebop 2. In this review we take a look at the affordable FPV Fly More Pack and why it offers such great value for money. Anyone who knows anything about drones knows that restricted flight time is the biggest frustration. Some of the toy quads have less than 5-minutes. The best ones reach 40+ minutes and there’s everything in-between. Some batteries are cheap whereas others cost a small fortune. Well, the Parrot Bebop 2 FPV Fly More Pack comes with two bonus batteries (three in total). This results in 74 minutes of flight time in ideal conditions. Already you can see why this capable quad has gotten off to such a good start. Now consider the short 55-minute battery recharge time and long 300m flight range—wow! OK, let’s see how this puppy flies. Takeoff, landing, and handling this quad in the air are great fun and exhilarating. The all-new SkyController 2 takes piloting the Bebop 2 up to a whole new level and deserves a page of its own. I wouldn’t suggest this as a first-time craft though. It’s certainly not a good first choice for kids—not even under supervision—but feel free to disagree. I just think there are better choices out there that cost a lot less and are more suitable for the crash-prone novice. Alas, this is not an overly impressive flyer in windy conditions despite its robust build and size. Sudden gusts can be a particular problem. The Parrot Beebob 2 provides a lot of flying fun for the more experienced pilot. It’s also fairly crash resistant. If you do damage or break something it’s not difficult to repair the craft. And the spare parts are easy to get hold of which is always good to know. Either of these methods puts the drone’s airborne HD 1080P 14MP camera right in front of your eyes. They all result in an exhilarating feeling. But you’ll want to operate the drone with the SkyController wearing the cockpit glasses for the ultimate and most immersive experience. Navigating obstacles and flying at high speed will give you an adrenaline rush like no other. Consider the Parrot Bebop 2 if you’re ready for FPV flying or simply want to upgrade from where you’re at. 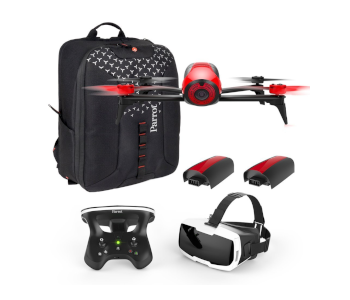 This FPV bundle is incredible value for money and a solid choice. It can be a good training drone at the entry level but I’d personally recommend it for the more experienced pilot. 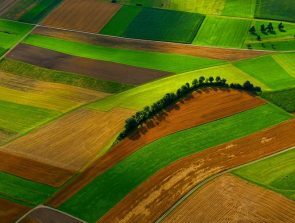 What are Multispectral Drones and How Can You Use Them?